According to my namesake, Greg McKenna, writing in Business Insider Australia, the governor of the Reserve Bank of Australia (RBA) Glenn Stevens, has made an explicit link between sub-par Aussie growth, related to rapidly falling commodity prices, among other things, and what the central bank perceives to be a significantly overvalued Australian dollar. In a speech in Tasmania overnight in GMT terms, the governor said “…investors are under-estimating the likelihood of a significant fall in the Australian dollar at some point”. He also said that the RBA had “ammunition” on interest rates. This was interpreted by traders as indicating that the next move on rates would be down, and could take place as early as December of this year. The Aussie fell significantly against both the US dollar and the New Zealand dollar in the wake of the governor’s comments. 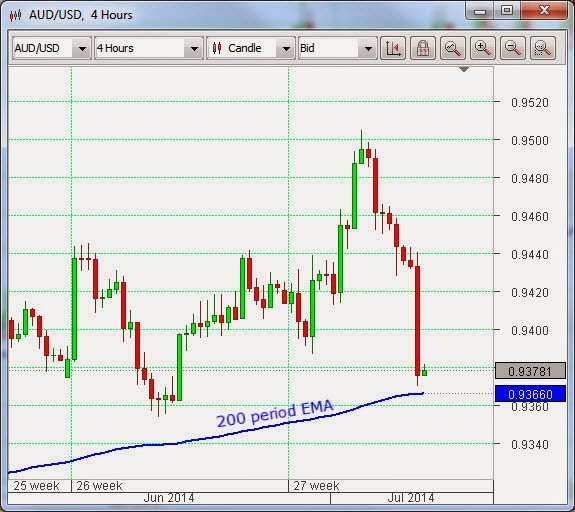 From the technical point of view, it is now approaching the 200 period Exponential Moving Average (EMA) on the AUDUSD four hour chart (above). A break through this will set the scene for a further fall. In the opposite direction, the Pound Sterling continues its steady rise against all major counterparts. The outcome of the UK Purchasing Managers’ Index for construction, yesterday, which showed an increase in June, added to the impetus. The Bank of England Monetary Policy Committee is now expected to raise core interest rates this coming November. As interest rate differentials are of abiding interest to the Carry Trade, the members of which attempt to effectively borrow in low interest rate jurisdictions and lend out in high rate ones, thereby driving up the currency that has a high rate and lowering those with depressed rates, the potential upcoming moves in Britain and Australia would make the GBPAUD currency cross one to watch in the coming months.